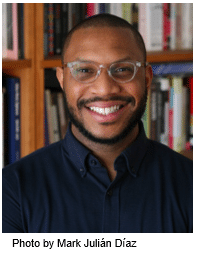 The Surdna Foundation is pleased to announce its hire of Robert Smith III as Program Officer of the Thriving Cultures program. Robert will help guide the implementation of the Thriving Cultures’ refined strategy, Radical Imagination for Racial Justice. In his new role he will develop and leverage relationships with key partners to support the advancement of Thriving Cultures’ programmatic goals. Robert will begin on March 4, 2019. Robert is a curator and arts administrator leveraging the power of art, culture, and memory to build a more just society. He most recently served as Associate Director of the National Public Housing Museum (NPHM), set to open in 2020 in Chicago, IL. NPHM is the only cultural institution devoted to telling the story of public housing in the United States. Robert has also held positions at the Art Institute of Chicago, the Walker Art Center, the Minnesota Historical Society, and OutRight Action International, an organization devoted to fighting for human rights for LGBTIQ people everywhere. Robert previously served on the boards of Project Fierce Chicago, a grassroots response to LGBTQ youth homelessness; the PFund Foundation, an LGBTQ community foundation based in Minneapolis; and the Brown University Alumni Association. Born and raised in South Florida, he is a graduate of Brown University and the University of Minnesota.